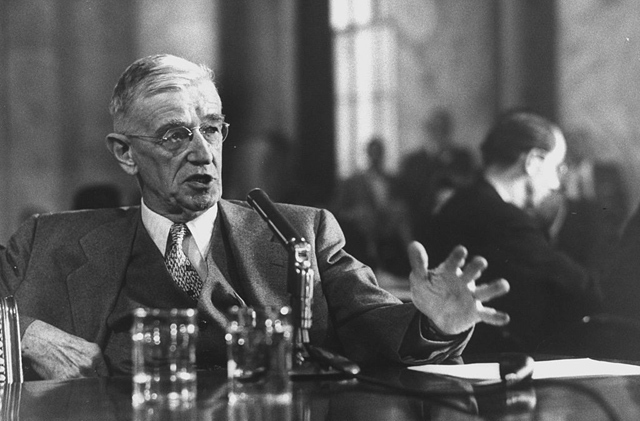 So deeply embedded in our cultural psyche that it seems like an echo of common sense, this powerful vision of science comes from Vannevar Bush, the M.I.T. engineer who had been the architect of the nation’s World War II research enterprise, which delivered the atomic bomb and helped to advance microwave radar, mass production of antibiotics, and other technologies crucial to the Allied victory. He became justly famous in the process. Featured on the cover of Time magazine, he was dubbed the “General of Physics.” As the war drew to a close, Bush envisioned transitioning American science to a new era of peace, where top academic scientists would continue to receive the robust government funding they had grown accustomed to since Pearl Harbor but would no longer be shackled to the narrow dictates of military need and application, not to mention discipline and secrecy. 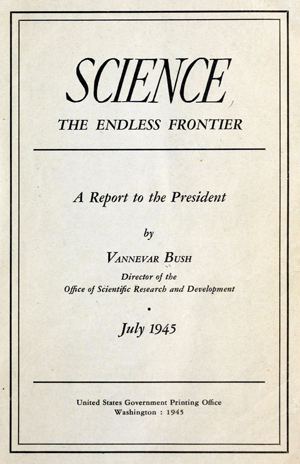 Instead, as he put it in his July 1945 report Science, The Endless Frontier, by pursuing “research in the purest realms of science” scientists would build the foundation for “new products and new processes” to deliver health, full employment, and military security to the nation. From this perspective, the lie as Bush told it was perhaps less a conscious effort to deceive than a seductive manipulation, for political aims, of widely held beliefs about the purity of science. Indeed, Bush’s efforts to establish the conditions for generous and long-term investments in science were extraordinarily successful, with U.S. federal funding for “basic research” rising from $265 million in 1953 to $38 billion in 2012, a twentyfold increase when adjusted for inflation. More impressive still was the increase for basic research at universities and colleges, which rose from $82 million to $24 billion, a more than fortyfold increase when adjusted for inflation. By contrast, government spending on more “applied research” at universities was much less generous, rising to just under $10 billion. The power of the lie was palpable: “the free play of free intellects” would provide the knowledge that the nation needed to confront the challenges of the future. To go along with all that money, the beautiful lie provided a politically brilliant rationale for public spending with little public accountability. Politicians delivered taxpayer funding to scientists, but only scientists could evaluate the research they were doing. Outside efforts to guide the course of science would only interfere with its free and unpredictable advance. The fruits of curiosity-driven scientific exploration into the unknown have often been magnificent. The recent discovery of gravitational waves — an experimental confirmation of Einstein’s theoretical work from a century earlier — provided a high-publicity culmination of billions of dollars of public spending and decades of research by large teams of scientists. Multi-billion dollar investments in space exploration have yielded similarly startling knowledge about our solar system, such as the recent evidence of flowing water on Mars. And, speaking of startling, anthropologists and geneticists have used genome-sequencing technologies to offer evidence that early humans interbred with two other hominin species, Neanderthals and Denisovans. Such discoveries heighten our sense of wonder about the universe and about ourselves. And somehow, it would seem, even as scientific curiosity stokes ever-deepening insight about the fundamental workings of our world, science managed simultaneously to deliver a cornucopia of miracles on the practical side of the equation, just as Bush predicted: digital computers, jet aircraft, cell phones, the Internet, lasers, satellites, GPS, digital imagery, nuclear and solar power. When Bush wrote his report, nothing made by humans was orbiting the earth; software didn’t exist; smallpox still did. So one might be forgiven for believing that this amazing effusion of technological change truly was the product of “the free play of free intellects, working on subjects of their own choice, in the manner dictated by their curiosity for exploration of the unknown.” But one would be mostly wrong. Science has been important for technological development, of course. Scientists have discovered and probed phenomena that turned out to have enormously broad technological applications. But the miracles of modernity in the above list came not from “the free play of free intellects,” but from the leashing of scientific creativity to the technological needs of the U.S. Department of Defense (DOD). The story of how DOD mobilized science to help create our world exposes the lie for what it is and provides three difficult lessons that have to be learned if science is to evade the calamity it now faces. First, scientific knowledge advances most rapidly, and is of most value to society, not when its course is determined by the “free play of free intellects” but when it is steered to solve problems — especially those related to technological innovation. Second, when science is not steered to solve such problems, it tends to go off half-cocked in ways that can be highly detrimental to science itself. Third — and this is the hardest and scariest lesson — science will be made more reliable and more valuable for society today not by being protected from societal influences but instead by being brought, carefully and appropriately, into a direct, open, and intimate relationship with those influences. Almost immediately after World War II, the Department of War — soon renamed the Department of Defense — began to harness together the complete set of players necessary to ensure the United States would have all the technologies needed to win the Cold War. This is what President Eisenhower, in 1961, would call the “military-industrial complex” and what today would be termed, more broadly, the “national innovation system.” It includes everything from university laboratories and scientists, to the small and large companies that develop and commercialize innovations, to the users of those innovations — in this case, the military itself. DOD was able to catalyze rapid innovation because money was, more or less, no object; the mission — ensuring that America’s military technologies were better than anyone else’s — was all that mattered. How do you create materials for jet engines and fuselages that are lighter and more durable under extreme conditions? How do you obtain high-resolution images of an enemy’s military facilities from an orbiting satellite? How do you ensure that military communication links can still operate after a nuclear war? These are the types of questions that the military needed to have answered, questions that demanded advances in fundamental knowledge as well as technological know-how. DOD’s needs provided not just investments in but also a powerful focus for advances in basic research in fields ranging from high-energy physics to materials science to fluid dynamics to molecular biology. At the same time, protected from both the logic of the marketplace and the capriciousness of politics by the imperative of national defense, DOD was a demanding customer for some of the most advanced technological products that high-tech corporations could produce. For example, the first digital computer — built in the mid-1940s to calculate the trajectories of artillery shells and used to design the first hydrogen bomb — cost about $500,000 (around $4.7 million today), operated billions of times more slowly than modern computers, took up the space of a small bus, and had no immediate commercial application. Who but the Pentagon would buy such a crazy thing? But DOD also supported the science needed to keep innovation going. In the late 1950s and well into the 1960s, as the role for computers in military affairs was growing but the science wasn’t keeping up, DOD’s Advanced Research Projects Agency essentially created computer science as an academic discipline by funding work at M.I.T., Carnegie Mellon, Stanford, and other institutions. Another example: The earliest jet engines, back in the 1940s, needed to be overhauled about every hundred hours and were forty-five times less fuel-efficient than piston engines. Why waste public money on such a technology? Because military planners knew that jet power promised combat performance greatly superior to planes powered by piston engines. For decades the Air Force and Navy funded research and development in the aircraft industry to continually drive improvement of jet engines. Meanwhile, the Boeing Company could take the jet-engine-powered aerial fuel tanker it was developing for the Air Force and use a similar design for its 707 passenger jet, the first truly safe and reliable commercial jet aircraft. And another: AT&T’s Bell Labs, where the transistor effect was discovered, could use the demands (and investments) of the Army Signal Corps for smaller and more reliable battlefield communication technologies to improve scientific understanding of semiconducting materials as well as the reliability and performance of transistors. It was military purchases that kept the new transistor, semiconductor, and integrated-circuit industries afloat in the early and mid-1950s. As historian Thomas Misa explained in his study of DOD’s role in stimulating the development of transistors: “By subsidizing engineering development and the construction of manufacturing facilities ... the military catalyzed the establishment of an industrial base” — helping to create the technological and industrial backbone for the information age. And new weapons such as missile systems and ever-more powerful nuclear warheads continued to drive the development of and demand for increasingly sophisticated and reliable electronic components such as microprocessors and supercomputers. Today, DOD continues to push rapid innovation in select areas, including robotics (especially for drone warfare) and human enhancement (for example, to improve the battlefield performance of soldiers). But through a combination of several factors — including excessive bureaucratic growth, interference from Congress, and long-term commitments to hugely expensive and troubled weapons systems with little civilian spillover potential, such as missile defense and the F-35 joint strike fighter — the Pentagon’s creativity and productivity as an innovator has significantly dissipated. Yet the scientific and technological foundations that DOD helped to create during the Cold War continue to support the American economy. To take just one example, of the thirteen areas of technological advance that were essential to the development of the iPhone, eleven — including the microprocessor, GPS, and the Internet — can be traced back to vital military investments in research and technological development. 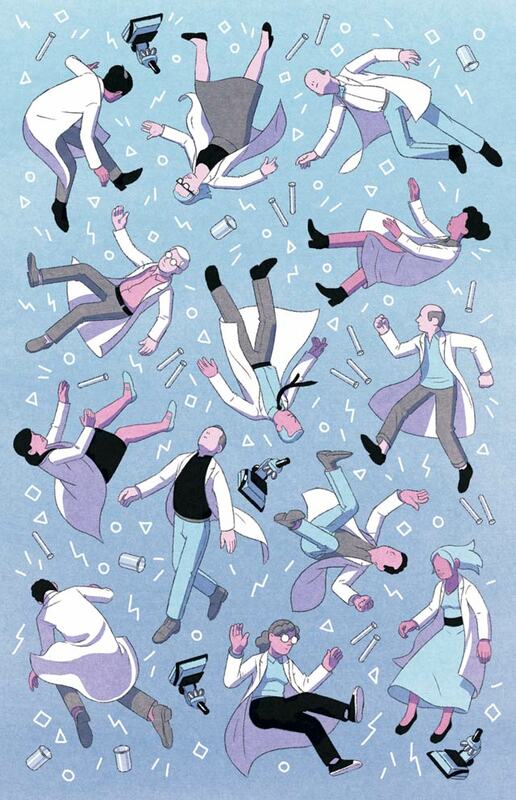 Americans lionize the scientist as head-in-the-clouds genius (the Einstein hero) and the inventor as misfit-in-the-garage genius (the Steve Jobs or Bill Gates hero). The discomfiting reality, however, is that much of today’s technological world exists because of DOD’s role in catalyzing and steering science and technology. This was industrial policy, and it worked because it brought all of the players in the innovation game together, disciplined them by providing strategic, long-term focus for their activities, and shielded them from the market rationality that would have doomed almost every crazy, over-expensive idea that today makes the world go round. The great accomplishments of the military-industrial complex did not result from allowing scientists to pursue “subjects of their own choice, in the manner dictated by their curiosity,” but by channeling that curiosity toward the solution of problems that DOD wanted to solve. Such goal-driven industrial policies are supposed to be the stuff of Soviet five-year plans, not market-based democracies, and neither scientists nor policymakers have had much of an appetite for recognizing DOD’s role in creating the foundations of our modern economy and society. Vannevar Bush’s beautiful lie has been a much more appealing explanation, ideologically and politically. Not everyone, however, has been fooled. Fran Visco was diagnosed with breast cancer in 1987. A Philadelphia trial lawyer intimidated by no one, she chose to be treated with a less toxic chemotherapy than the one her doctor recommended. She also started volunteering for a local breast cancer patient-support group, which soon led to an invitation to the organizing meeting of what came to be called the National Breast Cancer Coalition. NBCC was conceived as a political advocacy organization that would provide a unified voice for local patient groups across the nation — an approach that appealed to Visco’s activist nature. She became the organization’s first president, and has ever since been a national leader for mobilizing science, medicine, policy, and politics around the goal of eliminating the disease. Although Visco was at first “terrified” to find herself working with the military, she also found it refreshing and empowering — a “fantastic collaboration and partnership.” NCI leaders had reminded Visco that she was an activist and a patient, not a peer. But Gen. Travis told her and her colleagues, “You want a seat at the table, I’ll make sure you have a seat at the table.” The Army welcomed the participation of patient-activists in the planning process for the breast cancer program, directly involved them in the final selection of scientific projects to be funded, and eventually even brought them into the processes for reviewing the merits of various research proposals. DOD’s can-do approach, its enthusiasm about partnering with patient-advocates, and its dedication to solving the problem of breast cancer — rather than simply advancing our scientific understanding of the disease — won Visco over. And it didn’t take long for benefits to appear. During its first round of grantmaking in 1993–94, the program funded research on a new, biologically based targeted breast cancer therapy — a project that had already been turned down multiple times by NIH’s peer-review system because the conventional wisdom was that targeted therapies wouldn’t work. The DOD-funded studies led directly to the development of the drug Herceptin, one of the most important advances in breast cancer treatment in recent decades. There have been few major advances in breast cancer treatment since then, but one of the most promising — a targeted therapy called palbociclib — was funded by the same DOD program and was approved by the FDA in 2015 after successful clinical trials. Despite the objections of scientists advising the program, patient-advocates also pushed DOD to ramp up funding for immunological approaches to curing breast cancer, including support for vaccine research too unconventional to be supported by either NCI or the pharmaceutical industry. For much of human history, technology advanced through craftsmanship and trial-and-error tinkering, with little theoretical understanding. The systematic study of nature — what we today call science — was a distinct domain, making little or no contribution to technological development. Yet technology has contributed in obvious ways to scientific advance for centuries, as practical tools such as lenses, compasses, and clocks allowed scientists to study nature with ever greater accuracy and resolution. The relationship only started to swing both ways, with science contributing to technological advancement as well as benefiting from it, in the nineteenth century as, for example, organic chemistry both emerged from and found application in the German dye-making industry. Science has been such a wildly successful endeavor over the past two hundred years in large part because technology blazed a path for it to follow. Not only have new technologies created new worlds, new phenomena, and new questions for science to explore, but technological performance has provided a continuous, unambiguous demonstration of the validity of the science being done. The electronics industry and semiconductor physics progressed hand-in-hand not because scientists, working “in the manner dictated by their curiosity for exploration of the unknown,” kept lobbing new discoveries over the lab walls that then allowed transistor technology to advance, but because the quest to improve technological performance constantly raised new scientific questions and demanded advances in our understanding of the behavior of electrons in different types of materials. Or, again, consider how the rapid development of computers beginning in the 1950s, catalyzed by DOD, led to the demand for new types of theories and knowledge about how to acquire, store, and process digital information — a new science for a new technology. Thirty years later, computer scientists were probing phenomena in a rapidly developing technological realm that had never existed before — cyberspace and the World Wide Web — and were asking questions that could never have been imagined, let alone answered, before. The National Science Foundation funded basic research into this new, technology-created realm, including grants to two graduate students in computer science at Stanford University who wanted to understand how best to navigate the novel and expanding landscape of digital information. They published their results in the 1998 article “The Anatomy of a Large-Scale Hypertextual Web Search Engine.” The abstract begins: “In this paper, we present Google ...” — the web-search protocol that led to the corporate empire whose technologies are today woven into the fabric of daily life, and whose economic and social influence is every bit as powerful as the great railroad, steel, automobile, and telecommunications corporations of previous technological revolutions. Technology led; science followed. If, as Visco says, “at some point you really have to save a life,” it will be a technology, perhaps a vaccine or drug, that does the job. Technology is what links science to human experience; it is what makes science real for us. A light switch, a jet aircraft, or a measles vaccine, these are cause-and-effect machines that turn phenomena that can be described by science — the flow of electrons, the movement of air molecules, the stimulation of antibodies — into reliable outcomes: the light goes on, the jet flies, the child becomes immune. The scientific phenomena must be real or the technologies would not work. Vannevar Bush’s beautiful lie makes it easy to believe that scientific imagination gives birth to technological progress, when in reality technology sets the agenda for science, guiding it in its most productive directions and providing continual tests of its validity, progress, and value. Absent their real-world validation through technology, scientific truths would be mere abstractions. Here is where the lie exercises its most corrupting power: If we think that scientific progress is best pursued by “the free play of free intellects,” we give science a free pass to define progress without reference to the world beyond it. But if there is nothing by which to measure scientific progress outside of science itself, how can we know when our knowledge is advancing, standing still, or moving backwards? It turns out that we cannot. What is to be made of this ever-expanding litany of dispiriting revelations and reversals? Well, one could celebrate. “Instances in which scientists detect and address flaws in work constitute evidence of success, not failure,” a group of leaders of the American science establishment — including the past, present, and future presidents of the National Academy of Sciences — wrote in Science in 2015, “because they demonstrate the underlying protective mechanisms of science at work.” But this happy posture ignores the systemic failings at the heart of science’s problems today. C. Glenn Begley and John Ioannidis — researchers who have been courageous and visionary in exposing systemic weakness in biomedical science — concluded in a January 2015 article that “it is impossible to endorse an approach that suggests that we proceed with an ongoing research investment that is producing results the majority of which cannot be substantiated and will not stand the test of time.” Similarly, an economic analysis published in June 2015 estimates that $28 billion per year is wasted on biomedical research that is unreproducible. Science isn’t self-correcting; it’s self-destructing. You will need forty hours a week to perform teaching and administrative duties, another twenty hours on top of that to conduct respectable research, and still another twenty hours to accomplish really important research.... Make an important discovery, and you are a successful scientist in the true, elitist sense in a profession where elitism is practiced without shame.... Fail to discover, and you are little or nothing. The professional incentives for academic scientists to assert their elite status are perverse and crazy, and promotion and tenure decisions focus above all on how many research dollars you bring in, how many articles you get published, and how often those articles are cited in other articles. To bring in research grants, you need to show that your previous grants yielded “transformative” results and that your future work will do the same. 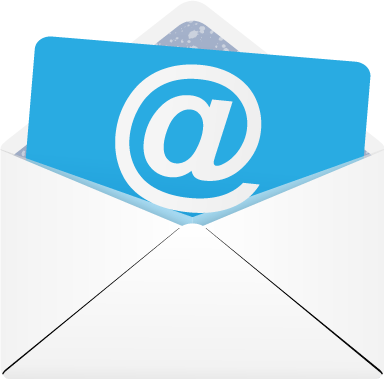 To get papers published, you need to cite related publications that provide support for your hypotheses and findings. Meanwhile, the peers who review funding proposals and journal articles are playing in the same system, competing for the same funds, motivated by the same incentives. To get the research done you need graduate students and postdoctoral fellows to do most of the grunt work of running experiments and collecting data, which is how they get trained and acculturated to become the next generation of academic scientists behaving the same way. Universities — competing desperately for top faculty, the best graduate students, and government research funds — hype for the news media the results coming out of their laboratories, encouraging a culture in which every scientist claims to be doing path-breaking work that will solve some urgent social problem. (Scientists themselves are complicit in the hype machine: according to one study, the frequency of positive words like “innovative,” “novel,” “robust,” and “unprecedented” in biomedical research publications in 2014 was nearly nine times as high as it was forty years earlier.) The scientific publishing industry exists not to disseminate valuable information but to allow the ever-increasing number of researchers to publish more papers — now on the order of a couple million peer-reviewed articles per year — so that they can advance professionally. As of 2010, about 24,000 peer-reviewed scientific journals were being published worldwide to accommodate this demand. These figures would not have shocked the historian of science and physicist Derek de Solla Price, who more than half a century ago observed that “science is so large that many of us begin to worry about the sheer mass of the monster we have created.” In his book Little Science, Big Science (1963), Price noted presciently that the number of scientists was growing so fast that it could only lead to a “scientific doomsday” of instability and stress, and that exponential growth of the scientific enterprise would bring with it declining scientific originality and quality, as the number of truly great scientists was progressively drowned out by the much more rapidly increasing number of merely competent ones. One cumulative result of these converging stresses (a result that Price did not anticipate) is a well-recognized pervasive bias that infects every corner of the basic research enterprise — a bias toward the new result. Bias is an inescapable attribute of human intellectual endeavor, and it creeps into science in many different ways, from bad statistical practices to poor experimental or model design to mere wishful thinking. If biases are random then they should more or less balance each other out through multiple studies. But as numerous close observers of the scientific literature have shown, there are powerful sources of bias that push in one direction: come up with a positive result, show something new, different, eye-catching, transformational, something that announces you as part of the elite. Yet, to fixate on systemic positive bias in an out-of-control research system is to miss the deeper and much more important point. The reason that bias seems able to infect research so easily today is that so much of science is detached from the goals and agendas of the military-industrial innovation system, which long gave research its focus and discipline. Nothing is left to keep research honest save the internal norms of the professional, peer-review system itself. And how well are those norms holding up? A survey of more than 1,500 scientists published by Nature in May 2016 shows that 80 percent or more believe that scientific practice is being undermined by such factors as “selective reporting” of data, publication pressure, poor statistical analysis, insufficient attention to replication, and inadequate peer review. In short, we are finding out what happens when objective inquiry is guided by Bush’s beautiful lie. “Scientific doomsday” indeed. A neuroscientist by training, Susan Fitzpatrick worries a lot about science and what Price called the “sheer mass of the monster.” “The scientific enterprise used to be small, and in any particular area of research everyone knew each other; it had this sort of artisanal quality,” she says. “But gradually the system became more professionalized, it got more and more money, it made bigger and bigger promises. So the qualities that make scientific research reliable, honest, got undermined by the need to feed the beast, and the system got too big to succeed.” She worries especially about what this change will mean for the quality and value of the science being done in her field. For example, scientists commonly use mouse brains to study neurodegenerative diseases like Parkinson’s or Alzheimer’s, or to study behavioral problems such as addictiveness or attention deficit disorders. What’s great about mice is that they yield to scientists’ methods. They can be bred in virtually limitless quantity, with particular traits designed into them, such as a gene mutation that triggers Alzheimer’s-like symptoms. This allows researchers to test specific hypotheses about, say, the genetics or neurochemistry of a mouse-brain disease. More than one hundred different strains of mice have been developed for the purpose of studying Alzheimer’s, and numerous chemical compounds have been shown to slow the course of Alzheimer’s-like symptoms in mice. Yet despite the proliferation of mouse and other animal models, only one out of 244 compounds that made it to the trial stage in the decade between 2002 and 2012 was approved by the FDA as a treatment for humans — a 99.6 percent failure rate, and even the one drug approved for use in humans during that period doesn’t work very well. And why should it be otherwise? The last common ancestor of humans and mice lived 80 million years ago. “You’re using animals that don’t develop neurodegenerative disease on their own,” explains Fitzpatrick. “Even aged mice don’t develop Alzheimer’s disease.” So researchers force some characteristic to develop — such as beta-amyloid plaques on the mouse’s brain, or age-related cognitive decline — but that’s not the same as the human disease in question, “because the process whereby you create that model is not the pathogenesis of the disease. Your treatment is focused on how you created the model, not how the disease occurs naturally.” There is little reason to believe that what’s being learned from these animal models will put us on the right path to understanding — let alone curing — human brain disorders. But it’s worse than that. Scientists cite one another’s papers because any given research finding needs to be justified and interpreted in terms of other research being done in related areas — one of those “underlying protective mechanisms of science.” But what if much of the science getting cited is, itself, of poor quality? Consider, for example, a 2012 report in Science showing that an Alzheimer’s drug called bexarotene would reduce beta-amyloid plaque in mouse brains. Efforts to reproduce that finding have since failed, as Science reported in February 2016. But in the meantime, the paper has been cited in about 500 other papers, many of which may have been cited multiple times in turn. In this way, poor-quality research metastasizes through the published scientific literature, and distinguishing knowledge that is reliable from knowledge that is unreliable or false or simply meaningless becomes impossible. A scientific model allows you to study a simplified version, or isolated characteristics, of a complex phenomenon. This simplification is sometimes justified, for instance, if the cause-and-effect relations being studied in the model (say, the response of an airfoil to turbulence in a wind tunnel) operate in the same way in the more complex context (an airplane flying through a storm). In such cases you can have some confidence that what you’ve learned from the model can be applied to the actual problem at hand. Fitzpatrick thinks that such reasoning is not justified when using mouse brains to model human neurodegenerative disease. Because these questions are incredibly complex and we’re trying to reduce it to some biological models, you have to create proxies. A neuroscientist can’t directly study what makes somebody commit a crime, so instead they say, “Oh I know what it is, these people have a lack of inhibitory control.” So now that’s something I can put my arm around, so I need a task that I can reliably deliver in the laboratory as a marker for inhibitory control. “Oh, and we have one, there’s this reaction-time task ...” Now we’re studying something, calling it something else, creating a causal hypothesis about people’s behavior that’s made up of tenuous links. Fitzpatrick is observing what happens when the interplay between science and technology is replaced by the “free play of free intellects.” Scientists can never escape the influence of human bias. But human bias doesn’t have much room to get a foothold when research is tightly linked to the performance of a particular technology — through, say, the desire for lighter, stronger automobile engines, or for faster, more efficient web search engines. Technology keeps science honest. But for subjects that are incredibly complex, such as Alzheimer’s disease and criminal behavior, the connection between scientific knowledge and technology is tenuous and mediated by many assumptions — assumptions about how science works (mouse brains are good models for human brains); about how society works (criminal behavior is caused by brain chemistry); or about how technology works (drugs that modify brain chemistry are a good way to change criminal behavior). The assumptions become invisible parts of the way scientists design experiments, interpret data, and apply their findings. The result is ever more elaborate theories — theories that remain self-referential, and unequal to the task of finding solutions to human problems. All this may go some way toward explaining why the rate of failure of pharmaceutical interventions for Alzheimer’s is so high. When mouse models are used to explore theories of human brain health and behavior, there is no reliable way to assess the validity of the science or the assumptions underlying it. This is not to say that scientists should just start conducting on humans the experiments they now perform on mice. But as Fitzpatrick emphasizes, the huge amount of mouse-brain research now being done is a reflection of the internal dysfunction of the research system, not of the potential for the “free play of free intellects” to help alleviate the human suffering caused by neurological disease and dysfunction. Problems of values, assumptions, and ideology are not limited to neuroscience but are pervasive across the scientific enterprise. Just as Derek Price recognized the threat to science from its unsustainable growth decades before the symptoms became painfully apparent, so was the threat of ideology in science flagged long ago by the physicist Alvin Weinberg. A bona fide member of the military-industrial complex, Weinberg ran the Oak Ridge National Laboratory — originally part of the Manhattan Project — and was a tireless advocate for nuclear energy. Involved as he was in the early political debates over nuclear power, he was concerned about the limits of what science could tell us about complex social and political issues. In his 1972 article “Science and Trans-Science,” Weinberg observed that society would increasingly be calling upon science to understand and address the complex problems of modernity — many of which, of course, could be traced back to science and technology. But he accompanied this recognition with a much deeper and more powerful insight: that such problems “hang on the answers to questions that can be asked of science and yet which cannot be answered by science.” He called research into such questions “trans-science.” If traditional sciences aim for precise and reliable knowledge about natural phenomena, trans-science pursues realities that are contingent or in flux. The objects and phenomena studied by trans-science — populations, economies, engineered systems — depend on many different things, including the particular conditions under which they are studied at a given time and place, and the choices that researchers make about how to define and study them. This means that the objects and phenomena studied by trans-science are never absolute but instead are variable, imprecise, uncertain — and thus always potentially subject to interpretation and debate. This combination of predictable behavior and invariant fundamental attributes is what makes the physical sciences so valuable in contributing to technological advance — the electron, the photon, the chemical reaction, the crystalline structure, when confined to the controlled environment of the laboratory or the engineered design of a technology, behaves as it is supposed to behave pretty much all the time. But many other branches of science study things that cannot be unambiguously characterized and that may not behave predictably even under controlled conditions — things like a cell or a brain, or a particular site in the brain, or a tumor, or a psychological condition. Or a species of bird. Or a toxic waste dump. Or a classroom. Or “the economy.” Or the earth’s climate. Such things may differ from one day to the next, from one place or one person to another. Their behavior cannot be described and predicted by the sorts of general laws that physicists and chemists call upon, since their characteristics are not invariable but rather depend on the context in which they are studied and the way they are defined. Of course scientists work hard to come up with useful ways to characterize the things they study, like using the notion of a species to classify biologically distinct entities, or GDP to define the scale of a nation’s economy, or IQ to measure a person’s intelligence, or biodiversity to assess the health of an ecosystem, or global average atmospheric temperature to assess climate change. Or they use statistics to characterize the behavior of a heterogeneous class of things, for example the rate of accidents of drivers of a certain age, or the incidence of a certain kind of cancer in people with a certain occupation, or the likelihood of a certain type of tumor to metastasize in a mouse or a person. But these ways of naming and describing objects and phenomena always come with a cost — the cost of being at best only an approximation of the complex reality. Thus scientists can breed a strain of mouse that tends to display loss of cognitive function with aging, and the similarities between different mice of that strain may approximate the kind of homogeneity possessed by the objects studied by physics and chemistry. This makes the mouse a useful subject for research. 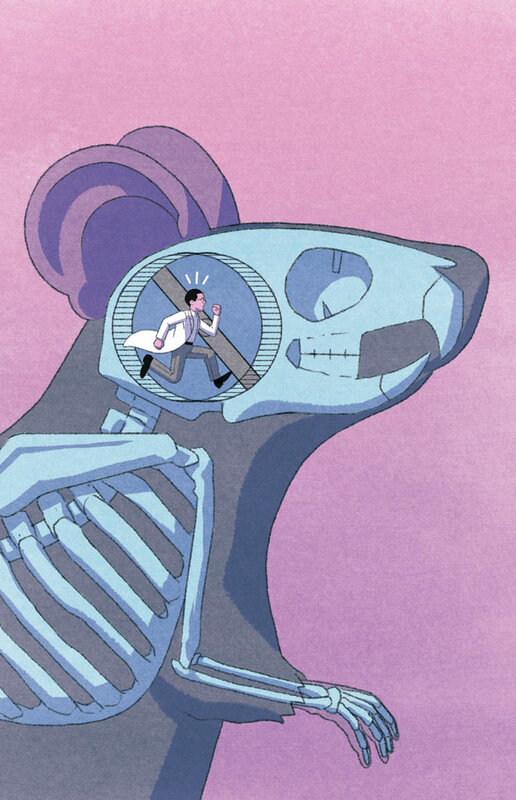 But we must bear the cost of that usefulness: the connection between the phenomena studied in that mouse strain and the more complex phenomena of human diseases, such as Alzheimer’s, is tenuous — or even, as Susan Fitzpatrick worries, nonexistent. For Weinberg, who wanted to advance the case for civilian nuclear power, calculating the probability of a catastrophic nuclear reactor accident was a prime example of a trans-scientific problem. “Because the probability is so small, there is no practical possibility of determining this failure rate directly — i.e., by building, let us say, 1,000 reactors, operating them for 10,000 years and tabulating their operating histories.” Instead of science, we are left with a mélange of science, engineering, values, assumptions, and ideology. Thus, as Weinberg explains, trans-scientific debate “inevitably weaves back and forth across the boundary between what is and what is not known and knowable.” More than forty years — and three major reactor accidents — later, scientists and advocates, fully armed with data and research results, continue to debate the risks and promise of nuclear power. Weinberg’s pleas for “selfless honesty” in drawing the lines of expertise have gone largely unheeded, as scientists have, over the past forty years, generally sought not to distinguish trans-science from science but to try — through what amounts to a modern sort of alchemy — to transmute trans-science into science. In fact, the great thing about trans-science is that you can keep on doing research; you can, as Fitzpatrick says, create “the sense that we’re gaining knowledge when we’re not gaining knowledge,” without getting any closer to a final or useful answer. In the absence of a technological application that can select for useful truths that work in the real world of light switches, vaccines, and aircraft, there is often no “right” way to discriminate among or organize the mass of truths scientists create. This is why, to take another endlessly contested example, after decades of intensive research about the effects of salt reduction on health, there is much less clarity today than in 1972, when a paper reported: “The evidence that salt induces permanent and fatal hypertension is direct, quantitative, and unequivocal in the rat.” Four decades later, the head of the Centers for Disease Control and Prevention was affirming that one hundred thousand deaths per year in the United States can be attributed to too much dietary sodium, even as a major meta-analysis of 167 randomized controlled trials and 13 population studies since 1950 found no clear connection between salt reduction and health outcomes. Scientists and interest groups line up on both sides of the salt debate, avidly impugning the motives and research of those they disagree with. The profusion of partial truths, each defended by its own set of experts, is what comes to pass when science tries to answer trans-scientific questions like: Are genetically engineered crops necessary for feeding a burgeoning global population? Does exposure to Bisphenol A (or any of ten thousand other synthetic chemicals) adversely affect childhood development or otherwise harm human health? Do open markets benefit all trading partners? What will be the future economic costs of a warming climate to a particular nation or region? Does standardized testing improve educational outcomes? Why is obesity rising in America, and what can be done about it? If both scientific research and political debates over such questions seem to drag on endlessly, surely one reason is that we have the wrong expectations of science. Our common belief is that scientific truth is a unitary thing — there is one fact of the matter, that’s why the light always goes on when I flip the switch. But trans-scientific questions often reveal multiple truths, depending in part on what aspects of an issue scientists decide to do research on and how they go about doing that research. There is no point in asking who is right in such cases; the best we can hope for is to understand why experts are disagreeing, which often hinges on highly technical choices about how to carry out research and analyze data, not to mention the hidden biases that help determine those choices. Consider the question “Are genetically modified crops more productive than conventional crops?” Some researchers prefer to answer this question by looking at field trials that allow variables like weather and soil type to be carefully controlled. Others prefer surveys of actual farms, because they reflect real-world variability. These two approaches often yield contradictory results, and there is no way of adjudicating based on the data which of the two provides a better guide to the future. There is a very good reason why the problem of poor-quality science is showing up most conspicuously in biomedical research. Even as government funding for biomedical science in the United States equals that of all other fields of research combined, diseases remain uncured, pharmaceutical innovation has slowed to a crawl, and corporate investments are extremely risky because of the staggering failure rates of new drug trials. Biomedical science is failing the truth-test of technology. But the more difficult and dangerous threat to science comes from areas of research where the stakes are high but the validity of the science cannot be determined — precisely because it is not closely tied to technological progress toward a specific, shared goal (like curing breast cancer). In these cases, science delivers partial truths, any one of which can advance the career of a researcher and attract a constituency of believers among scientists, political interest groups, and members of the public alike. Even the vaunted scientific consensus around climate change — which largely rests on fundamental physics that has been well understood for more than a century — applies only to a narrow claim about the discernible human impact on global warming. The minute you get into questions about the rate and severity of future impacts, or the costs of and best pathways for addressing them, no semblance of consensus among experts remains. Mathematical models of future rates and consequences of climate change are highly sensitive to assumptions about things that are totally unpredictable (such as trends in economic growth or technological innovation), and so the models spew out endless streams of trans-scientific facts that allow for claims and counterclaims, all apparently sanctioned by science, about how urgent the problem is and what needs to be done. If we were instead to exercise the “selfless honesty” advocated by Weinberg and own up to the assumptions that led us to the results of the climate (or mouse) models, then we would have to abandon any claim to an absolute, scientific truth that gives those results their legitimacy in society. The imperative of technological advance focuses scientific inquiry, and provides a test for the validity of new scientific knowledge. Big data does the opposite, casting science into a sea of data with few constraints on where it might drift. The difficulty with this way of doing science is that for any large body of data pertaining to a complex problem with many variables, the number of possible causal links between variables is inestimably larger than the number a scientist could actually think up and test. For example, researchers have identified more than a hundred variables that may influence obesity, from genes to education to job stress to how fast you eat to whether you were breastfed. Exploring the relations between even some small number of combined variables would give you billions of possible hypotheses to test. The likelihood that you will happen upon one that reveals important causal relations is thus extremely small, while the opportunities for introducing bias or discovering meaningless correlations abound. So even if you get a positive result, it will likely be spurious. As John Ioannidis explains in his famous 2005 article “Why Most Published Research Findings Are False,” the problem of searching for a small number of possible true relationships in large data sets “totally reverses the way we view scientific results. Traditionally, investigators have viewed large and highly significant effects with excitement, as signs of important discoveries. Too large and too highly significant effects may actually be more likely to be signs of large bias in most fields of modern research.” But no matter — once you have a positive finding, the web puts the world’s scientific literature at your beck and call, and you can effortlessly trawl for peer-reviewed published papers to lend credibility to your discovery. And even if you do happen to confirm a real causal link, for it to be useful you would probably have to connect it to other such links, each of which is itself unlikely to be true. Perhaps obese people with less education, more job stress, and a specific genetic marker do eat more quickly than others, but the reason they are obese may be due to something else entirely, say, not having time to exercise because they live far from work. If mouse models are like looking for your keys under the street lamp, big data is like looking all over the world for your keys because you can — even if you don’t know what they look like or where you might have dropped them or whether they actually fit your lock. The biotechnology revolution was bound to fail, given the limits of predictive science to solve problems in complex natural phenomena.... [T]he experience of genetics in medical research has demonstrated that a moving frontier in scientific knowledge does not translate to a corresponding advance in technological innovation. Blinded by the lie, enthralled by the power of new technologies not to solve discrete problems but to gather, store, test, and analyze billions of terabytes of data about everything that goes on anywhere — from Earth’s core to the human brain to the outer atmosphere — and religiously dedicated to the notion that more information, more peer-reviewed publications, and more funding is always a step in the right direction, whatever direction that may be, the scientific community and its supporters are now busily creating the infrastructure and the expectations that can make unreliability, knowledge chaos, and multiple conflicting truths the essence of science’s legacy. Science is in a pincer grip, squeezed between revelations that entire areas of scientific inquiry are no good, and the willy-nilly production of unverifiable knowledge relevant to the unanswerable questions of trans-science. Even as the resulting chaos compromises technological progress — aimed at, say, preventing or curing breast cancer — the boundary between objective truth and subjective belief appears, gradually and terrifyingly, to be dissolving. When Marqusee talks about the need to “manage research” he doesn’t mean telling scientists how they should do their work, or even what they should work on; he means making sure that the science that’s being done makes sense in terms of the goal to which it is supposed to contribute. The types of questions Marqusee needed to have answered at DOD were essentially trans-scientific — the necessary truths and effective solutions were contextual, varying from one situation to the next. They were biased toward the local and specific, rather than career-enhancing discoveries. To figure out, for example, “how to protect my soldiers” from poisons like lead, cadmium, and chromium in the soil on military bases, he first had to understand questions like: How does the dry, poor-quality soil typical of many military bases affect soldiers’ exposure to toxic chemicals? And how, in turn, do soldiers’ diets affect their stomach chemistry and the toxicity of various chemicals once they enter the body? Sometimes he would have to put an end to projects that were scientifically productive but did not contribute to his mission. One such project — “a basic research project, great proposal” — promised to develop indicators that could show when activities on a military facility were having adverse effects on a protected animal species before it suffered severe population decline. But during a project review Marqusee came to understand that the researcher was simply identifying and measuring “all sorts of biomarkers — steroidal stress levels, dozens of them,” and that in the end he would find lots of correlations, just as you can find a million reasons for why Americans are growing obese or why public school performance isn’t improving or why lack of inhibitory control will make you a drug-addled criminal. Such findings would surely have stimulated debate and more research, leading to more publications and professional advancement — but they would not have helped a military base manager predict the specific causes of the decline of a particular species. Right. Not only would the National Science Foundation never have killed it, but it exemplifies the big data spirit that is fast becoming the new face of science. In the applied physics Ph.D. program at Harvard, Kumar started with an interest in linking science to health care needs in poor countries. He quickly focused on a specific question: “How do we bring the information that we get from studying blood into low-resource settings?” The question pushed him in two directions: into the social context, to see what needs could be met with better information on blood; and into the science, to see what theories and tools could provide that information. So he talked to doctors who had experience working in Africa, and he talked to scientists in his lab and elsewhere, and this eventually led to a convergence between the two: a technique to separate proteins using a simple type of centrifuge that had been around for fifty years. This technique could be used for separating blood cells, which could potentially help diagnose sickle-cell disease, a health problem that lacked a quick, cheap, portable, and reliable diagnostic procedure. Kumar wraps up the story with modest alacrity: “So we were able to get some collaborators, start researching, doing the first experiments, and getting initial positive results,” showing that sickle-cell could reliably be diagnosed by density separation. “This allowed us to really charge forward and start the quest for funding, clinical validation, and trials, which took up the rest of my Ph.D.” The test he came up with can be done on-site in fifteen minutes, and it costs less than a dollar. Kumar was a one-man medical-industrial complex, coordinating all aspects of the research process, including commercial development, and using technological performance as a ruthless arbiter of scientific progress. In short, he made his research accountable to the end-user rather than to his scientific peers. This is really all that Fran Visco is asking for. Of course ending breast cancer is a vastly more complex scientific and organizational problem than finding a cheap and fast way to diagnose sickle-cell disease. But that would seem to be all the more reason why, after all the billions spent — and with forty thousand women a year still dying from the disease in the United States alone — someone needed to be accountable for driving the system toward a solution. So Visco and her colleagues decided that NBCC would shoulder that burden and start managing the science itself. “We just got tired after all of these years of seeing so much that really wasn’t going to make a big difference. We have no interest in the continued funding of these things.” Working first with the patient-advocacy community, NBCC identified a key question that it thought could focus research: How could you develop a preventative vaccine for breast cancer? In March 2010, NBCC brought together a diverse group of scientists to see if this was a question that could decisively be pursued given the current state of knowledge; the group’s consensus view was that it could and it should. NBCC has attracted about thirty scientists, many of them from leading cancer research groups, to work on the Artemis vaccine project, now in its sixth year. “These are people who never would have collaborated and never would have been asking this question if it weren’t for us,” says Visco. They have selected the antigens that will be targeted by the vaccine, and are starting to plan for clinical trials, to think about how they can ensure affordability and access if the trials succeed, and even to explore the idea of starting up a nonprofit vaccine company. With the vaccine effort successfully underway, NBCC also started a second leg of the Artemis Project, this one focused on stopping breast cancer from metastasizing to other parts of the body, a problem that had, like vaccine research, mostly been neglected by the mainstream research community. Will the vaccine succeed? No one can know, but it’s the wrong question. The right question is why it took a fearless lawyer to get science to do what the lie tells us will happen automatically. Is science today just the latest candidate for inclusion in the growing list of failing institutions that seems to characterize our society? As with democratic politics, criminal justice, health care, and public education, science’s organization and culture are captured by a daunting, self-interested inertia, and a set of values reflecting a world that no longer exists. Yet science does have advantages over other sclerotic institutions. Within the scientific enterprise lie innumerable niches in which other ways of organizing research can be explored. Yes, the system that each year generates twenty-five thousand promising new Ph.D. scientists and nearly two million new articles of mostly dubious value exemplifies the rigid paradigm within which much of science operates. But Kumar notes a “hunger” among the young scientists he knows to do more than just add to the piles of esoteric knowledge. Their challenge will be to find the niches in the system that allow them to contribute something more, allowing the system to evolve, gradually, in a better direction. Indeed, an especially hopeful attribute of science is that it can be leveraged even by individuals and small organizations to have big impacts, as Visco, Marqusee, and Kumar have shown. In the future, the most valuable science institutions will be closely linked to the people and places whose urgent problems need to be solved; they will cultivate strong lines of accountability to those for whom solutions are important; they will incentivize scientists to care about the problems more than the production of knowledge. They will link research agendas to the quest for improved solutions — often technological ones — rather than to understanding for its own sake. The science they produce will be of higher quality, because it will have to be. The current dominant paradigm will meanwhile continue to crumble under the weight of its own contradictions, but it will also continue to hog most of the resources and insist on its elevated social and political status. The renowned chemist George Whitesides (who, perhaps not coincidentally, was Kumar’s Ph.D. advisor) argued in The Economist in 2012 that, in the past century or so, purely curiosity-driven science has delivered only one or two fundamentally transformational breakthroughs (quantum mechanics and perhaps genomics), and that, given this performance record, keeping science separate from technology “may or may not be an affordable luxury.” A different way to put it might be that the sort of undisciplined exploration that Vannevar Bush was peddling back in 1945 should be seen now in much the same light as space travel, support for the arts or for public monuments, and wilderness protection. However worthwhile and ennobling it may be for its own sake, it cannot be justified in terms of solving problems or guiding policy decisions — or even of leading toward verifiable truth. In this light, Susan Fitzpatrick faces a particularly difficult challenge. She wants the philanthropic foundation that she leads to maximize the potential for neuroscience to help reduce human suffering, but she doesn’t think that this field has much to say yet about lessening the terrible burdens of most brain diseases. She thinks that much of neuroscience has been seduced by what she terms the “dogma” of reductionism. “Everyone is convinced that if you can find the genetic molecular explanation for something now then you understand it and hence you can fix it, even though there is literally no evidence for this.” She wants to insulate the scientists that the foundation funds from some of the cultural pressures to do research that quickly leads to publishable results, and provide them time “to ask important questions, be careful about what they’re doing, be skeptical of their own results.” One project underway looks at extreme long-term survivors of malignant brain cancer to see how their tumors interact with the rest of the body and other environmental influences. Why do treatment technologies that are ineffective for most patients show positive results for a very few? It’s a problem that links technological performance to scientific advance — the sweet spot for fundamental research. But Fitzpatrick also wonders if biomedical science undervalues other kinds of research that could offer solutions to pressing problems. “There’s not a lot of research on how best to socially, emotionally, environmentally, support Alzheimer’s patients, that might ameliorate their own anxiety, their own stress — maybe the disease, as horrible as it is, would be less horrible through a better care structure, but we do very little research on that.” Perhaps for now, research to help people with these diseases ought to aim at more practical questions. “I don’t think you can tell people ‘Well, we’ve got another forty years of research that we’re going to have to do’ when we also don’t know if there are better ways of supporting people.” And maybe in the process of understanding how better to help patients, scientists will discover things about the course of the disease and its varieties that can lead to effective therapies. “What’s been lost is the continual back-and-forth between the science and the real disease” that has, historically, been the source of major medical advances.